WASHINGTON – The number of holiday travelers will be up this year in both the state and the nation, according to AAA, which estimates that 908,000 Arizonans will be among the 48.5 million Americans hitting the road for Thanksgiving. That’s about a 5 percent increase over holiday travel last year for both the state and the nation. But that increase in traffic means more than just an increase in traffic jams – it means higher likelihood of accidents, which is why safety experts stress the need for seatbelt use, particularly during the holidays. “People are rushing around, they’re thinking about other things and they’re distracted. It’s crucial to be buckled up all the time,” said Russ Rader, senior vice president of communications with the Insurance Institute for Highway Safety. But in Arizona, the decision to buckle up is a more personal one than it is in most states. Arizona law does not require adults to buckle up in the back seat. And it is a “secondary enforcement” state, meaning that while police can cite a driver or front-seat passenger for failing to wear a seatbelt, they can’t pull them over for it – they have to have stopped them for something else first. Arizona is one of a handful of states with both secondary enforcement and back-seat exemptions, according to the National Conference of State Legislatures. “You do have states that are enforcing primary seatbelt legislation for front- and rear-seat passengers,” said Ann Kitch, a transportation research analyst at NCSL. Ken Kolosh, statistics manager of the National Safety Council, said states like Arizona are going in the wrong direction with their seatbelt laws. Alberto Gutier of the Arizona Governor’s Office of Highway Safety agrees that seatbelts save lives, and his office encourages all motorists to always wear their seat belts, to put children in car seats and to drive sober. But he challenged the claim that Arizona is going in the wrong direction with its seatbelt laws, noting that seatbelt use has steadily risen in the state where seatbelt use is “way ahead” of states with primary enforcement laws. “Kansas, Arkansas and Mississippi, they all have primary seatbelt law and, guess what? We beat them in the usage rate, we’re at 87 percent,” Gutier said. Gutier said there are many factors that can contribute to a fatal accident, and lack of seatbelts is just one of them. 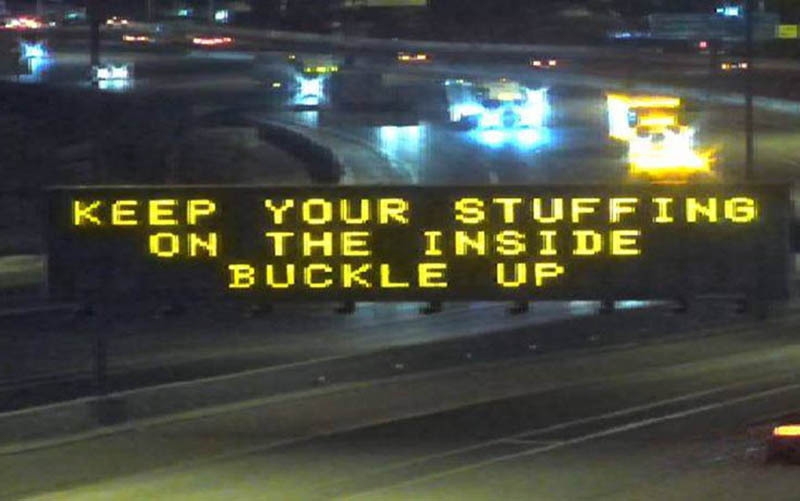 The most recent report from the Arizona Governor’s Office of Highway Safety said there were 962 motor vehicle fatalities in 2016, of which 329 were deaths of passengers who were not buckled up. Both the number of fatalities and the number of those victims were unrestrained at the time of the crash has risen steadily in recent years, as the number of people on the road in Arizona has risen. Whether the law requires it or not, however, Rader said buckling up is important, even in the back seat. He said that when passengers do not buckle up in the back seat that they “essentially become a human missile” during a crash. “You’re moving forward at tremendous force and … not only are you at high risk of injury yourself, but you’re also risking injury to the people in the front seat, even if they are belted,” Rader said. Conrad Jackson, a paramedic engineer with the Prescott Fire Department, is among the emergency responders who are often the first at the scene of car crashes said he has seen the evidence firsthand.